Mexican film director Alejandro González Iñárritu, along with top photographers Mary Ellen Mark, Patrick Bard, Graciela Iturbide, and Miguel Rio Branco, bring together their highly perceptive visions on cultural diversity in a book that combines seductive images and firsthand remarks on the unique experience of shooting Babel. Winner of the Best Director prize at the 2006 Cannes Film Festival, the film is the third in the director’s trilogy started by Amores Perros and 21 Grams. Shot in Morocco, Tijuana, and Tokyo, and involving a multilingual cast lead by Brad Pitt, Cate Blanchett, Gael García Bernal, and Koji Yakusho, as well non-professional actors from the three countries portrayed, Babel continues the director’s quest to explore the effects of loss and grief, and seeks to relate the modern implications of ancient myth on the origins of human inability to successfully communicate. 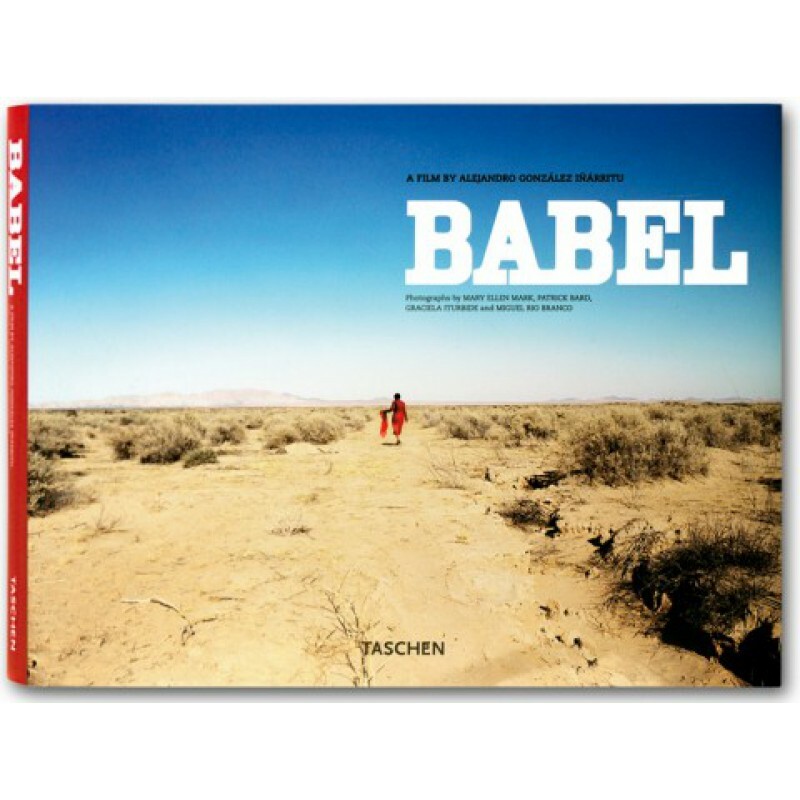 This book is a visual recollection of the parallel stories and real-life characters that revolved around the making of Babel, and the unexpected ways in which fiction and reality collide. Photographs both from the set and the surrounding disparate landscapes are paired with the director’s personal commentary on the larger-than-life film shoot. Introduced with essays by novelist and poet Eliseo Alberto and Gonzalez Iñárritu, as well as an interview with the director by Rodrigo García, the result is an engaging book that both complements Babel’s powerful statement on the barrier of language, and reveals the fascinating reality of the people and places that inspired the film. The director: Born in Mexico City in 1963, Alejandro González Iñárritu studied filmmaking and theater and composed music for Mexican features before directing and producing his debut feature film, Amores Perros (2000), which was nominated for an Academy Award as Best Foreign Language Film and received over 53 awards from all over the world, including BAFTAs, the Golden Globes, Tokyo, Sao Paulo, Edinburgh, San Sebastian, and Toronto. Iñárritu’s follow-up film, 21 Grams (2003), which he directed, co-wrote, and produced, starred Sean Penn, Benicio del Toro, and Naomi Watts. Both Del Toro and Watts received Oscar nominations for their roles in the film and Penn won the Jury Prize for Best Actor at the Venice Film Festival. Babel, which will be released worldwide in November 2006, garnered the Best Director Prize at the 59th Cannes Film Festival. Iñárritu lives in Los Angeles with his wife and two children. Patrick Bard is a journalist and a professional photographer who has written articles for the French and international presses about the Mexico-United States border. Bard is also the author of several novels, some of which have been adapted for the theatre. American documentary photographer Mary Ellen Mark has achieved worldwide visibility through her numerous books, exhibitions, and editorial magazine work. For almost three decades, she has traveled extensively to make pictures that reflect a high degree of humanism. Miguel Rio Branco, a Magnum photographer since 1978, was born into a family of diplomats and grew up in Portugal, Brazil, Switzerland and the United States. A ceaseless experimenter in expressive and lyrical color photography, he has been awarded several prizes for his work and has published numerous photography books. Eliseo Alberto is an award-winning author, journalist, and filmmaker. He has written three books of poems; and his publications include the novels Caracol Beach and La eternidad por fin comienza un lunes. Born and raised in Cuba, he now lives in Mexico City. Mexican writer/director Rodrigo García’s credits include Things you can tell just by looking at her (Fondation Gan Award, Cannes 2000) and Nine Lives (Winner Locarno Film Festival, 2005). Maria Eladia Hagerman was born and raised in Mexico City, where she received her degree in graphic design. She has designed and collaborated on several book projects.